The new storefront bar area. Mahmood Popal, a designer with Craft Studio. About 60 new seats will take the place of the projection booth that used to sit at the back of the balcony. In terms of reinventions, renewals, and reincarnations, the Danforth Music Hall is practically feline with its multiple lives. And a new one is just beginning. In early December, the theatre quietly began staging shows after more than a year of locked doors and silent nights. Five weeks’ and six figures’ worth of renovations and cosmetic updates under its new owners, Impresario Inc., have turned the East End relic into a modern musical hub, or so they’re hoping. 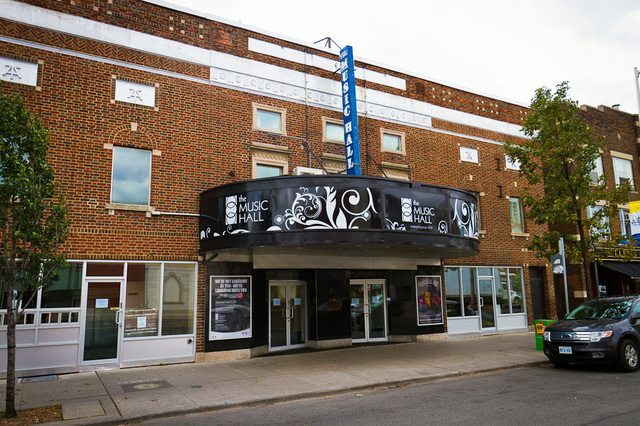 “We want it to be an anchor for the area, financially and socially,” explained the Danforth Music Hall’s new general manager, Michael Sherman, who’s hoping to host two to three shows a week in the theatre, which has about 1,100 seats. From the outside, the hall looks more or less unchanged. But immediately inside, a patron is hit, or rather isn’t, with the removal of a partition wall that once separated will call from the rest of the lobby. On the left is a new coat check area, and to the right is an arresting refreshment area, its focus piece a heavy, wood apothecary-style bar accented by a white grid-like shelving unit and an archival black and white photo. All of the Music Hall’s new designs are by Craft Studio. Straight ahead is the main bar, with a similar design, only it is backed by a photo of the Danforth Music Hall when it first opened as Allen’s Danforth (the same photo seen in this post). Both the main lobby, upper lobby, and artist rooms behind the stage have a new coat of cool grey paint and new carpeting. Inside the actual theatre, relatively few touches have been made. While it boasts a new lighting and sound system, a few repairs to the roof, and 60 new seats where the projector once sat, Sherman and Impresario Inc. didn’t want to take on the job of repainting and re-plastering all the ornate molding in the historical venue. Instead, those updates will most likely happen next summer, which would close down the theatre again for about a month. “We’re going for a boutique hotel look […] encompassing the history of the building, combining the old and the new,” Sherman said. It’s the next chapter in the venue’s almost 100-year history. After opening as a cinema in 1919, it moved hands less than five years later from the Allen Theatre Chain to Famous Players and was renamed the Century. That died in the ’60s, and it became a mostly Greek cinema, Titania Theatre. In the ’70s, live acts started taking to the stage, and it slid into a second-run and rep movie theatre. There was a brief hiatus from 2004 into 2005, resurrected by some repairs and updates that turned it into a legit live performance venue—until last year, when it was seized for unpaid rent. Besides Lee’s Palace, it’s Toronto’s last of 10 original Allen Theatre venues still in operation. Now, Sherman says the Danforth Music Hall will act as a live performance venue for all kinds of art forms—music acts, comedy, theatre, musicals, movies, even video shoots and private functions. So far, it has hosted the Genesis cover band the Musical Box, the Broadway Bootcamp Bravo special, comedy shows, and fundraisers; more shows are booked into March. With an official launch slated for February 2012, here’s hoping the Danforth’s new life will be a long one.